Wednesday film introduction from Catharina Manchanda, contemporary art curator at Seattle Art Museum! Herb and Dorothy: they sound like one more couple your grandparents played pinochle with. But if it’s Herb and Dorothy Vogel, their favorite pastime is actually modern art, and the collection they amassed for fun in their apartment is now worth millions of dollars. In 2009 Megumi Sasaki offered up a portrait of this old married couple as friendly and unassuming as the couple themselves, sneaking a question or two about the culture of art admiration into a real-life tour of modern art’s most famous works. This follow up movie about the pair looks at them as they close the door on their life as collectors, distributing 50 works to an art institution in each of America’s 50 states. Join us on Wednesday, October 9 for a film introduction from Catharina Manchanda, contemporary art curator at the Seattle Art Museum. 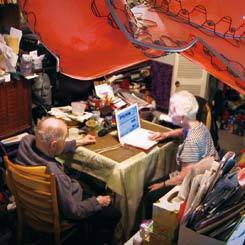 Passionately devoted to contemporary art and artists, Herb and Dorothy Vogel, a New York City postal clerk and his wife, a librarian, began in 1962 to build what would become a legendary art collection. Seeking to share their love for contemporary art with others, the Vogels donated a sizable portion of their collection to the National Gallery of Art in Washington. This initial gift led to the creation of The Dorothy and Herbert Vogel Collection: Fifty Works for Fifty States project, which enabled the Vogels to share works from their collection nationwide. The Seattle Art Museum is the beneficiary in Washington State. To find out more about the SAM works included in the Vogel gift, visit www.vogel5050.org.